Well, it's happened again. I've killed a Palm Pilot. I know Penn & Teller would say that the story about people who can stop watches and kill other technological bits and bobs is all BS, but... I swear, I can do it. Ask me about my drawer of dead wristwatches. I have quite a collection. And now, it appears that I have to add Palm Pilots to my list of Things Merujo Kills. This was my replacement Palm III, a lovely gift from my friends back home, The Usual Suspect-ettes. And, it's worked just fine and dandy until tonight. Tonight, I turned it on and it started the most un-Palm-like light and sound show, whirring and clicking and flashing a bright green across the screen. I shut it down, took out the batteries, put in new ones, and voila! Even louder whirring and clicking and a brighter green screen. Then, a small amount of smoke issued forth from the back. Now, I've gotten used to small battery-operated items that start to suddenly smoke. The portable interpreting devices we used at my former place of employment used to do this on an alarmingly regular basis. (Oh, I bet at least one person was thinking of something else small, battery-operated and smokin'. Bad, bad reader. Very bad!) Those interpreting radio units were costly little suckers, but when the smoking started, you knew it was time to shoot Ol' Yeller. So, I didn't totally freak out when the Palm had its wee meltdown tonight. 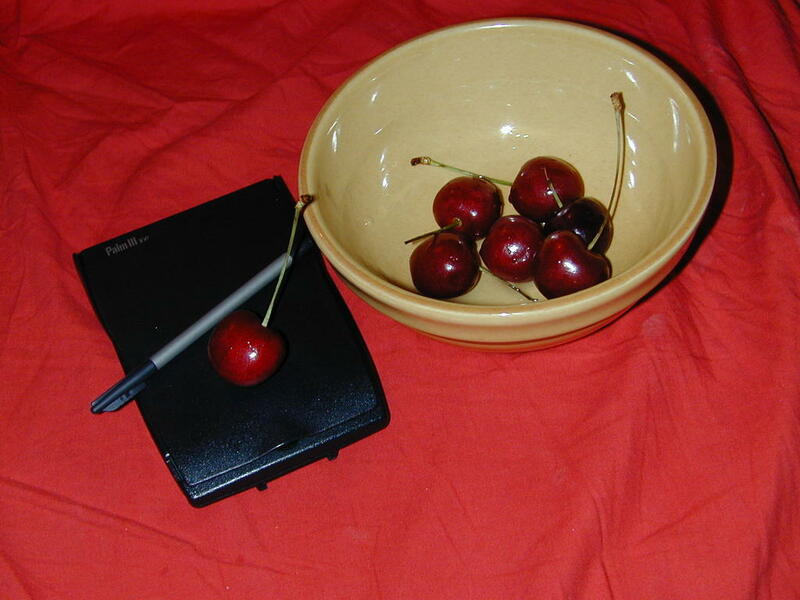 I sighed, took the batteries out again, observed a moment of silence, and then decided that the best course of action was to simply forget about it and have a bowl of cherries. Le Palm est morte. Here, have a cherry. And thus endeth another of my adventures in technology. A hearty thank you to the fine ladies who procured this item for me. I promise, it shall receive a Christian burial. I'm giving up for the night. A shower, a good book, some ice cold raspberry seltzer water, and another handful of Bing-y goodness await. Yum. If the cherries start to smoke and make noise, I'm screwed. I've a IIIx that's been looking for a good home for ages. Stopped using it when I switched from an iMac to a PowerBook (then years later another PowerBook) as my shootin' iron. Since the 'book is with me pretty much all day, the poor Palm never got a look in.